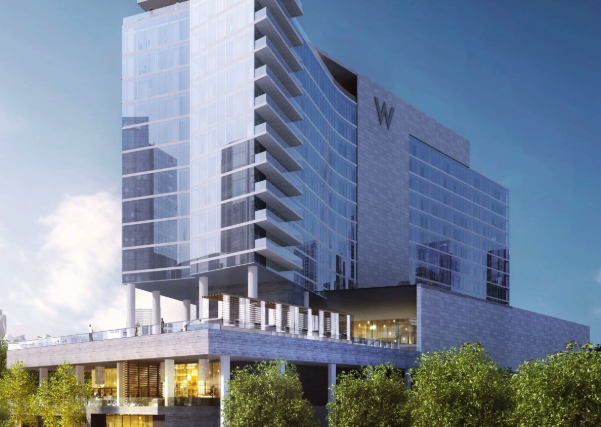 Sanders Hyland Corporation was recently awarded the W Nashville; the newest addition of W Hotels Worldwide, part of Marriott International. Designed by HKS and the Rockwell Design Group, W Nashville will enhance the live-work-play atmosphere of The Gulch by fusing design, fashion, and music in a way that differentiates the property from any other in the Nashville market. The 13-story, 400,000 SF hotel will consist of 346 guestrooms including 50 suites and two Extreme WOW Suites (W’s take on the Presidential Suite). The project will also feature a two-level underground parking garage, cafe, specialty restaurant, retail space, meeting and event space, and a wet deck (pool) complete with luxe cabanas, grill, and a poolside bar. No Replies to "W Hotel in Nashville, TN"